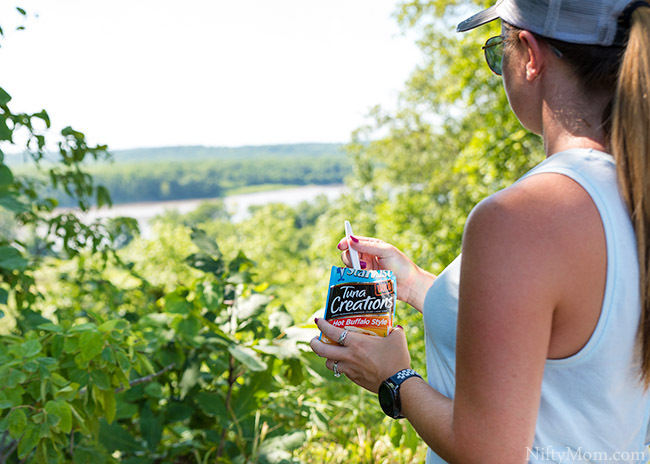 Being on-the-go often means having snacks and meals outside of the house. Being health-conscious, the easiest way I stick to nutritious meals no matter where I am, is by meal prepping. 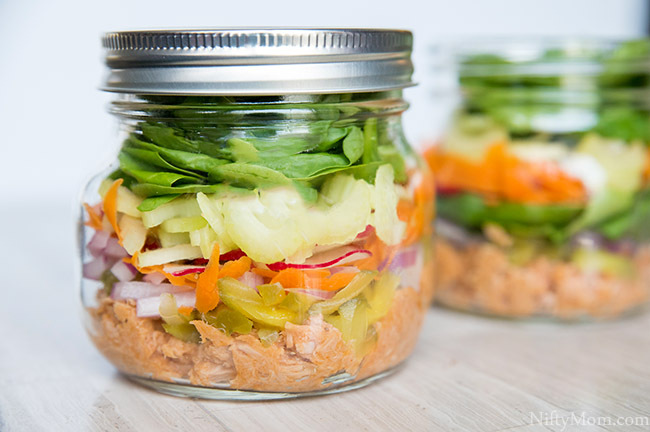 This buffalo tuna salad in a jar is an easy snack or meal to make ahead and take on the go. I am proud to say I am still going strong this year with self-care and being more health-conscious. On the flip side, as an active family of 5, our schedules are crazy full and we are always out and about. A full schedule comes with the simple fact that all meals and snacks can’t be consumed around our dining room table. Instead, we have to pack up some food to bring along with us. There are days we just aren’t sure when we will be back home. 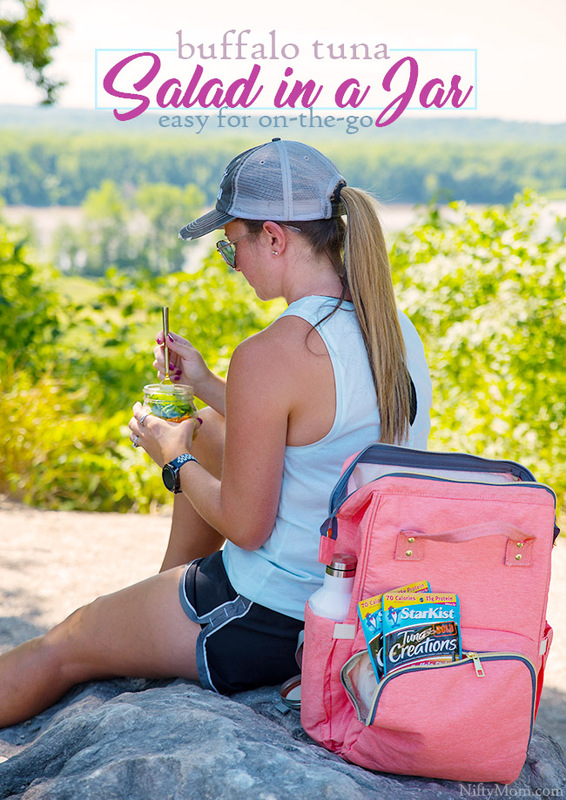 There are some foods that make eating on-the-go easier, without having to prep anything. 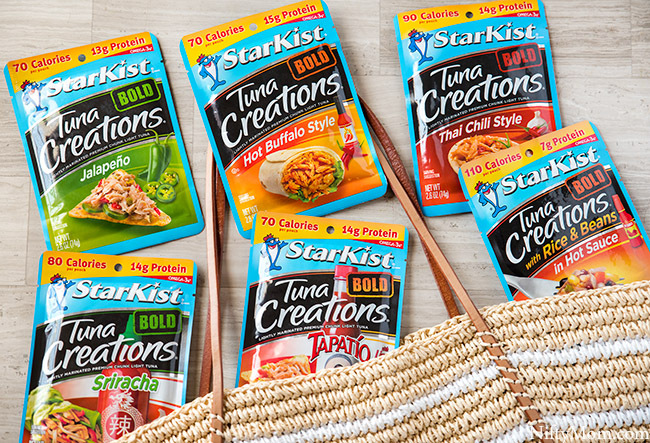 Take StarKist Tuna Creations® BOLD pouches, for example. Their BOLD flavors offer delicious & nutritious meal solutions to fit busy lifestyles and add an extra kick of flavor. Each pouch is a good source of lean protein and contains 110 calories or less to keep me fueled. Why are they great for on-the-go? The pouches are single-serve, require no can opener and there is no draining. Easy peezy. You can literally just grab a fork and eat straight from the pouch wherever you are—just Tear. Eat. And Go! They can also be used to add a BOLD protein to salads, meals and snacks. They are available in 6 BOLD varieties, including StarKist Tuna Creations® BOLD Thai Chili Style, Tuna Creations® BOLD Jalapeño, Tuna Creations® BOLD Hot Buffalo Style, Tuna Creations® BOLD Tapatío, Tuna Creations® BOLD Sriracha and Tuna Creations® BOLD with Rice & Beans in Hot Sauce. When we were doing meal prep last weekend, I made a some of my salads in a jar. One great addition to a salad is the Tuna Creations® BOLD Hot Buffalo. 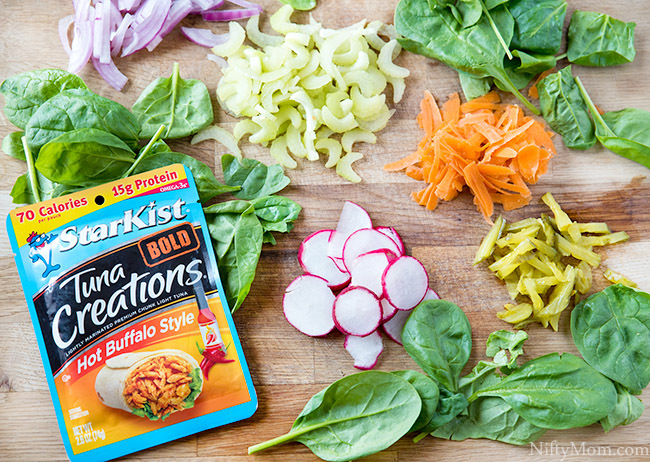 StarKist combined premium tuna with cayenne peppers for an authentic and BOLD Buffalo Sauce taste. Each pouch provides a spicy boost of protein to any salad, wrap, or right from the pouch. In a mason jar (regular sized or wide mouth, as shown), layer ingredients. It works best to add the tuna first, then the pickles, since they are wet. Then layer the onions, carrots, radishes, celery and top with the spinach leaves. If I am using a good amount of spinach leaves, I put an additional layer of spinach in between the radishes and carrots. Seal and refrigerate up to 3 days and enjoy for a nutritious snack or as an addition to a meal. 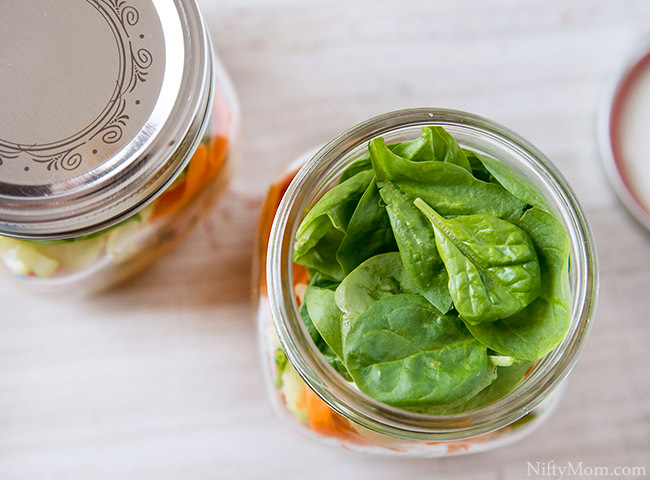 The salads in a jar are easy to throw in a cooler or lunchbox before heading out for the day. With all our errands, I like to take time out to visit local outdoor spots, even if it is just for 30-40 minutes. 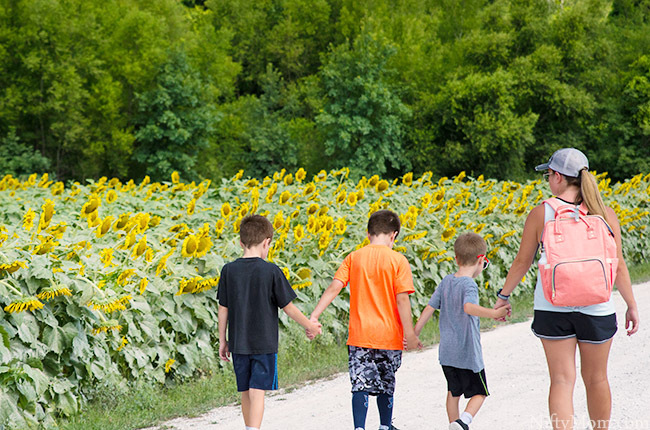 This week I took the boys (along with their cousins and aunt) to visit a local conservation area that has glorious views and a sunflower field. It was a nice way to unwind and get some fresh air. We went an hour or so after breakfast, so we packed snacks not knowing how long we were going to be there. 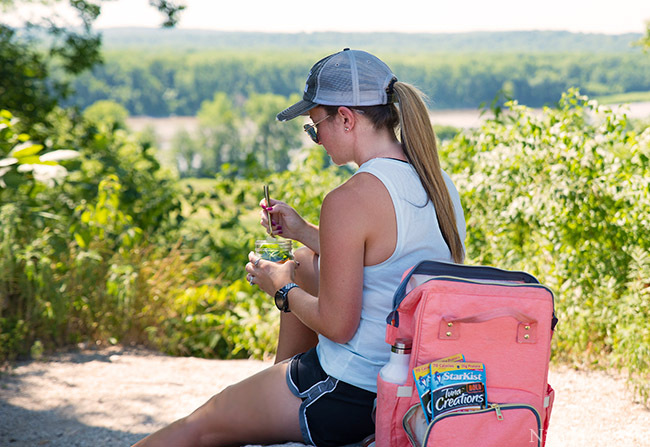 On our walk, we found a lookout over the river and took the time to relax and eat a snack. 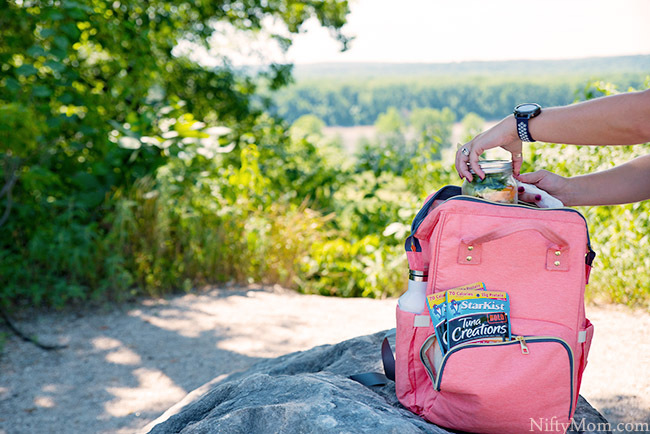 A few varieties of Tuna Creations® BOLD flavors stay in my backpack at all times and I had a salad in a jar in my lunch bag ready to enjoy that day. Make sure you are following @StarKistCharlie on Instagram and Twitter and like StarKist on Facebook for more information and the latest updates. What BOLD flavor is your favorite?